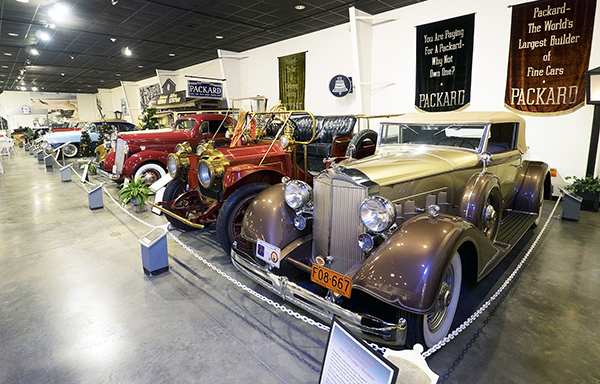 IMOA members have a chance to visit the National Packard Museum in Dayton during the annual IMOA show in August. In 1899, the first Packard Motor Car was built in Warren, Ohio, at the Packard Electric Company’s subsidiary plant, the New York and Ohio Company. Manufacture of a successful automobile brought about the formation of the Ohio Automobile Company, which evolved into the Packard Motor Car Company in 1902. The birth of the Packard Motor Car company began when James and William Packard traveled to Cleveland in 1898 to purchase a brand new Winton automobile for $1,000. James had the knowledge and means to build a better car. He was a mechanical genius who had earned a degree in engineering from Lehigh University and had obtained several patents even before founding the Packard Electric Company with his brother. Armed with knowledge and experience, the brothers convinced wealthy Winton investor George Weiss to join them in the automobile business. The first Packard automobile was built in a corner of Packard Electric’s New York and Ohio lamp plant on North Street (now Dana Street) and rolled out onto the streets of Warren on Nov. 6, 1899. From the very beginning, Packard built luxury vehicles for an exclusive clientele. William D. Rockefeller was so impressed by the Packard automobiles exhibited at the first National Automobile Show in New York City in 1900 that he bought two of them. One of the many vexing problems confronting U.S. automobile manufacturers at the time was that of electric wiring. Suitable cable for the high-tension circuit were not available in this country, and only limited quantities of an inferior grade could be had from Italy and France. The brothers capitalized on this opportunity and set about developing a cable suitable for not only Packard automobiles, but other auto manufacturers, as well. This led to the development of the Packard Lac-Kard Cable in 1901. An early issue with pre-Packard ignition cables was the presence of Corona – an ozone gas emitted when power is fed through a cable or wire. Corona would quickly deteriorate the rubberized insulation found on early spark plug wires. When that happened, cracking or separation persisted, and the wires would “leak” electricity in the form of arcing. This leaking caused greatly reduced engine power. Packard developed machines early on to test for Corona levels and assess the damaging effects. The birth of the Lac-Kard cable meant the use of treating the rubber insulation on the wires with a lacquer coating until they were saturated and sealed from the corrosive ozone gas. Doing so prevented the failures found in early ignition sets. This quickly became an industry standard. Eventually, the brothers sold the Packard car company to Michigan investors, led by Henry Joy Jr., who moved car production to Detroit. This allowed the Packards to focus on what had quickly become the largest and most profitable division of Packard, electrical systems. 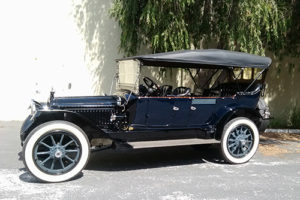 One of the early cars produced by the newly independent Packard Automotive was the 1903 Model F. One of these, dubbed the “Old Pacific,” made the first transcontinental journey from San Francisco to New York City in May of 1903. Designed to showcase Packard’s industry-leading quality and durability, the Old Pacific was the first (of three other cars made by different auto manufacturers) to complete the trip, 63 days later. 1903 also marked the first year that Packard automobiles were equipped with a dual-cylinder engine, at a time when most were single cylinder. In 1904, a Packard Model K “Gray Wolf” set one-, five- and ten- mile land speed records, using a prototype four-cylinder engine developed and tested by engineer Charles Schmidt. The Gray Wolf featured a 275.6 c.i. engine that produced approximately 25 hp at 1,000 rpm. In 1906, James Packard stepped down as Packard Electric president, turning over the position to a fellow Lehigh alumnus, Newton A. Wolcott. Ten years later, the Packard brothers would sell the company to a group of investors led by Wolcott. Despite his departure from leading the company, James continued to lead the electrification movement in his hometown, eventually leading to another first for Warren, Ohio. In 1911, Warren became the first city in the United States to light its streets with all- incandescent light bulbs. The Packards sold their lamp division, which eventually became General Electric. In 1912, a Packard truck carrying a three-ton load traveled from New York City to San Francisco over a period of 16 days. 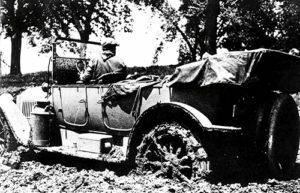 Much like the journey of the Old Pacific, this journey was an endurance challenge designed to showcase the durability of Packard vehicles. This durability would be needed to supply the forthcoming wartime effort brought about by World War I. This journey was also aided by the ongoing construction of the Lincoln Highway, America’s first stone-paved coast-to-coast road. The completion of the highway was a milestone in not only American history, but Packard’s as well, as the Packard Automobile’s president at the time, Henry B. Joy, was also the president of the Lincoln Highway association and was instrumental in its formation. The motor company built trucks to support the war effort and also adopted the moving assembly-line process with the advent of Packard “Series” cars. The Packard Motor Company would continue to set new records as their line of engines found their way into multiple land-, water- and air- based competition machines, and Packard aircraft engines would power the first U.S. Navy airships. Packard would also suffer its first heavy internal losses with the crash of the first company plane, and the deaths of founders James and William Packard. In addition to transitioning leadership and preparing for the war effort, 1915 was also the year that a Packard Twin Six Typhoon set a new land-speed record, averaging 103.35 mph over 32 laps at the Sheepshead Bay two-mile track. After Packard introduced the six- cylinder engine option in 1913, the “Twin Six” was born, boasting a full 12-cylinder “V” style configuration. A three-speed transmission was mated to a multiple-disc clutch, rare in even high-performance cars. One year later, a Packard 299 set a new Indianapolis speed record for engines of 300 c.i. at 100.76 mph. The 299 was named for its engine displacement in cubic inches. The V-12 engine was designed by Packard’s Chief Engineer Jesse Vincent and was originally designed for aircraft use; however, Vincent thought it was cheaper and safer to test new engines in automobiles. Another innovative feature of the 299 was an all-aluminum body that kept vehicle curb weight to a minimum. The company made the switch to volume-based production of vehicles that were more attainable to the working class, while still maintaining the ability to cater to the premium market. Advances in engine technology set new standards for speed and performance, and innovations like electronic overdrive and suspension enhancements kept Packard ahead of the competition. In 1935, Packard unveiled its first sub-$1000 car in order to battle Depression sales – the One Twenty Coupe. Following the release, sales tripled for the company and took Packard from what many described as an engine company and coachworks operation into a full-scale auto manufacturer. The One Twenty model was spun off of Packard’s new single-assembly line process that was implemented at their Grand Avenue facility. This allowed for a low-cost, volume-based vehicle that could be built in multiple configurations at the same time on the same line. 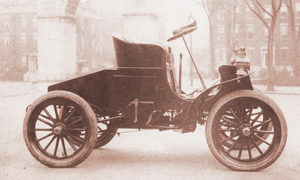 The initial three-passenger business coupe started at just $980. Packard switched to wartime production during World War II and in a matter of months, its employment mushroomed from 350 to more than 3,500 employees. It not only produced automobile and truck engines, but also ones for ships and aircraft. 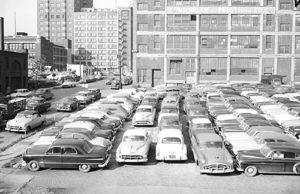 However, the lack of raw materials available after the war stifled Packard’s high-volume production – in 1950, only 42,000 cars were produced. Packard merged with Studebaker in 1954, which drained money from the company and it was slow in offering a V-8 engine, which the Big Three already had. Sales continued to decline and the last Packard was made in 1959.